Medical laboratory technologists conduct medical laboratory tests, experiments and analyses to assist in the diagnosis, treatment and prevention of disease. Medical laboratory technologists who are also supervisors are included in this group. Medical laboratory technologists work in many settings including medical laboratories in hospitals, blood banks, community and private clinics, research facilities and post-secondary educational institutions. Medical laboratory technologists may specialize in particular areas, such as clinical chemistry, clinical microbiology, hematology, histotechnology, transfusion science, diagnostic cytology and clinical genetics. Workers perform varying duties described below. Most medical technologists and pathologists' assistants typically work 35–40 hours per week. Working hours vary depending on the type of laboratory. Those working in diagnostic clinical laboratories or hospitals may work rotating shifts of days, evenings and nights, including weekends and holidays. Medical technologists and pathologists' assistants in research laboratories usually work regular week day hours. Work takes place in bright, well-ventilated laboratories. During their work day, workers may perform a variety of tests or they may repeat the same tests throughout the day. They use solutions and reagents for their work, which may have unpleasant odours. These workers may come in contact with infectious patients, samples or hazardous chemicals, so safety precautions are taken to avoid risks. Job openings will come from job creation and the need to replace retiring workers, with job growth outpacing openings from retirements. 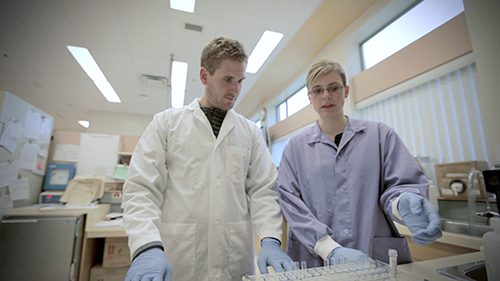 Industry sources report a current shortage of medical laboratory technologists in B.C., which is expected to continue in the coming years. The growing demand for health-care services will increase job opportunities for medical laboratory technologists and pathologists' assistants. In particular, hospitals and medical laboratories that provide contracted diagnostic services are expected to experience growth that will create new job opportunities. Industry sources also report that there will be an increased demand for general medical laboratory technologists throughout Canada, and that workers in rural and remote communities may be particularly needed. An increased demand for clinical genetics technologists is expected as a result of the growth of molecular testing. A decrease in demand for diagnostic cytology technologists is also expected as a result of automation. The introduction of simplified tests for routine diagnoses allow doctors and, in some cases, patients to carry out some tests themselves, which has reduced the number of medical technologist and pathologists assistants. However, the development of new diagnostic tests now requested by physicians has balanced this effect by increasing job opportunities. Graduates may work in a number of different settings, such as private laboratories, community health clinics, public health facilities, university research labs, biotechnology companies, and specialty labs. With education and experience, workers may progress to supervisory or senior management positions or they may choose to teach or work in private industry. Advanced certification (ART) is available from the Canadian Society for Medical Laboratory Science for technologists who want to go after management opportunities.